For centuries, in every culture, people from around the world have included some sort of fermented food, teaming with probiotics, into their diets on a regular basis. As it turns out, there is a great reason for this ancient, universal dietary practice. Fermented foods are one of the best ways to get a healthy dose of probiotics. One serving of sauerkraut can have as many probiotic bacteria as an entire bottle of probiotic supplements! 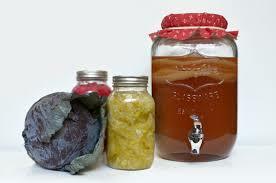 All of these fermented foods are easy to make at home. Check out the recipe tab for my favorite fun and delicious fermented food recipes.